Warning: Results pictures are graphic. 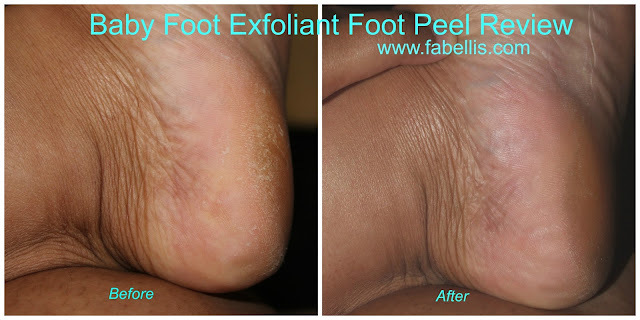 I have to admit that when I saw colouredBeautiful's review of the Baby Foot Exfoliant Foot Peel, I was sold! I knew after years of having pedicures that only temporarily relieved my calloused feet, that I needed something new. Since spring was approaching, I opted to order Baby Foot directly from their online website. Surprisingly, it took about two weeks for the product to arrive. When I ordered it, I wasn't made aware of a back order or shipping delay so I'm not sure why the shipping took so long. When I received it, I automatically decided to give it a try. The instructions were very simple! 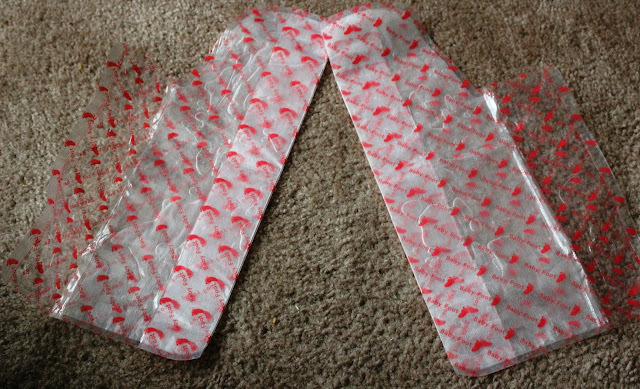 You simply put the booties on, tape in place and sit with them on for an hour. In the instructions, it suggests you soak your feet beforehand. I opted to not soak my feet, but in hindsight, I feel that I should have and you will see why soon. After sitting for an hour and rinsing off baby foot, I didn't notice any immediate results. In fact, almost four days had gone by before anything began to happen. It started off gradually and then my feet were peeling like crazy! Since the product label recommends only light lotion, I opted to just bare through the peeling. You all may think I'm weird, but I actually enjoyed peeling off the layers of skin. They didn't hurt at all. After about two weeks, the peeling was completely done. My toes, top and sides of my feet were indeed baby soft. Unfortunately, my calloused heels were still there, although not nearly as hard as they were before. I love the results and for the price, it was just like a trade off for a pedicure. I just wish I had soaked my feet beforehand to see if that truly made the difference. I ended up getting a pedicure a little over a month later and that's when I truly felt like I had the feet I desired. Yes! I would recommend this product. Just be aware that results vary. Although my calloused skin was still there, my feet overall looked amazing! I think this product is definitely the gateway to better feet if you do suffer from callouses like I do and if you don't, this might be the only thing you need to keep your feet looking great all summer. No pedicure required! If shipping is a concern for you, I would look for a retail store in your area by clicking here. Would you give the Baby Foot Exfoliant Foot Peel a try? Products mentioned were purchased with my own money. Ordered this product, can't wait to try it out!